...or, my return to working with yarn in the name of research. This week, I needed to knit something. It didn't matter what it was, though with a toddler I knew it needed to be easy and interruptible. I decided on a chunky scarf in garter stitch, using mondo needles so it would be fast, productive work. I was feeling productive -- feeling as though I simply had to make something with my hands. So I started this project. I am also immersed in reading for a research project I am working on about the field of library and information science (LIS), and more specifically, the positioning of information literacy within it. This research will hopefully turn into a journal article soon after the new year. On my second day of working on the scarf, it occurred to me that it might be very productive to alternate reading sections of challenging LIS theoretical scholarly literature, with knitting several rows of my scarf. 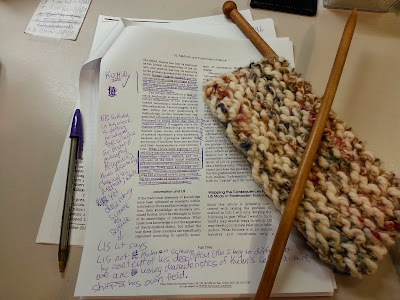 The goal would be to use the knitting time to process and reflect upon the reading I just did, and then return to the reading refreshed and ready to tackle the next set of ideas. And so, I tried it... and my goodness, talk about the perfect marriage of two activities. I don't want to say too much about it yet -- I'm not yet in a position to try to figure out why doing these two things together is so successful for me. I need to do it more. And so, I shall. Information Science Education 37.4 (1996): 317-324, and a chunky garter stitched scarf. 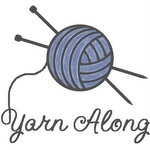 I plan to link up with Yarn Along at Small Things for as long as I am using knitting as a means of processing and reflecting upon the reading I am doing for my research. So, this week's knitting project: the beginnings of a chunky garter stitched scarf. I just love this stuff. And knitting makes me love it even more.